The most famous names of Armenian poetry in the twentieth century were victims either of genocide (Taniel Varoujan and Siamanto), political repression (Yeghishe Charents), or car accident (Paruyr Sevak). Among them, Charents was probably the brightest star in the Armenian literary sky. Portrait of Yeghishe Charents by Martiros Saryan. 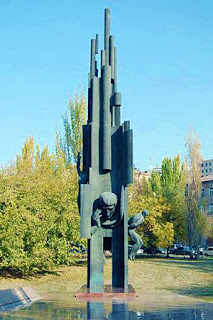 A memorial sculpture of Charents in central Yerevan. Yeghishe Soghomonian, the future poet, was born in Kars, on March 13, 1897. His parents had moved there from Maku, in Iran, and had seven children. After his elementary studies at the Russian or Armenian parochial school, he studied in the royal school of the city from 1908-1912, but he did not graduate. The young Yeghishe published his first poem in 1912 and his first book, Three Songs to the Sad Girl, dedicated to his girlfriend Astghik Kondakjian, in 1914. Here he adopted the pseudonym of Charents (Armenian char “bad”), for which there are various contradictory explanations. In August 1915, at the age of eighteen, Charents enrolled himself in the Armenian volunteer corps of the Russian army, and fought in the Caucasian battlefront against the Ottoman army until the end of the year. His war experiences gave birth to his first relevant work, the poem Dante-esque legend, published in 1916. In 1916-1917 Charents was in Moscow, where he studied at the Shaniavski Popular University. After the October Revolution, he returned to the Caucasus and first participated in the civil fights in the Northern Caucasus. His experiences were the basis for one of his most important poems, The Frenzied Masses, published in 1918. After the liberation of Kars from Turkish occupation, he became a teacher in one of the villages of the Kars district in 1919. Nikol Aghbalian, Minister of Education of the first Republic of Armenia and a well-known literary critic, lectured in October 1919 on Charents with a very positive outlook. In January 1920 he became an official at the ministry until June, when he left after participating in the Bolshevik demonstrations of May 1. After the establishment of the Soviet regime, he entered the Communist Party and was designated head of the Art section of the Commissariat of Education. During the February 1921 rebellion, he fought as a soldier in the Red Army. In June 1921 he married Arpenik Ter Astvatzatrian and they departed together for Moscow, where they studied at the University for Workers of the Orient. In 1922 he published his collected works in two volumes and returned to Yerevan, where he would become a leading name in the efforts to modernize Armenian poetry and in the different literary movements, while publishing poems and collections of poetry. From 1921-1924 he also wrote his novel Land of Nayiri, first published serially and then as a book (1926). In 1924-1925 he traveled abroad and visited Istanbul, Rome, Venice, Paris, and Berlin. In September 1926 Charents was involved in a criminal incident when he shot and slightly wounded a young girl whom he had fallen in love with. In November he was sentenced to eight years of imprisonment, later reduced to three, in the House of Correction (prison) of Yerevan, and previously he was expelled from the Communist Party. This situation coincided with the death of his wife Arpenik on January 2, 1927, at the age of twenty-eight, due to an extra-uterine pregnancy. Charents was freed on humanitarian grounds, given his extremely fragile psychological condition, and sent to mandatory treatment at a sanatorium. From 1928-1935 the poet worked at the Armenian State Publishing House and developed a prolific editorial program, including the publication of new writers and Armenian classics, as well as translations. After a kidney surgery in Moscow (1929), he developed the use of morphine, which he would continue until the end of his life. In 1931 he married Isabela Niazova, and they would have two daughters, Arpenik and Anahit. Literary and political pressure over him, as well as on the best representatives of the Armenian intelligentsia was mounting. In 1933 Charents’ most important collection of poetry, The Book of the Road, was forbidden before publication. It was released in 1934 only after the poet excluded several works that had been questioned. In this year, he participated in the First Congress of Soviet Writers, held in Moscow. His downfall started in 1935, when he was fired from his job, expelled from the Writers Union of Armenia, and interrogated several times at the Ministry of Internal Affairs on trumped-up charges of being a terrorist. The assassination of Aghasi Khanjian, First Secretary of the Armenian Communist Party and his friend and protector, on July 9, 1936, covered up by Joseph Stalin’s henchman Laurenti Beria, First Secretary of the Party in Transcaucasia, as a “suicide,” unleashed the political persecution against Armenian intellectuals. Many writers and intellectuals were arrested on July and August 1936, and they would be shot, exiled to Siberia, or sentenced to years in a wave of terror that continued until 1938-1939. Charents was subjected to house arrest in September 1936, his books were retired from libraries and bookstores, and the publication of his works was stopped. The poet was finally imprisoned on July 1937. His wife would follow the same fate (she was deported to Kazakhstan for five years in 1938), and their children would be placed in an orphanage as “enemies of the people.” Charents, gravely ill, passed away in the hospital of the Yerevan prison on November 27, 1937. His body was buried in an unmarked grave and the exact place of his tomb remains unknown. Charents was rehabilitated after the death of Stalin, and his name became extremely popular among youngsters and adults. His works have been published many times, and statues, streets and a museum perpetuate his name in Armenia. 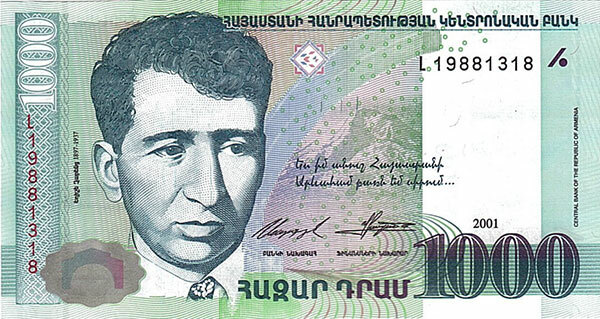 Charents is featured on the 1000 dram bill of the Republic of Armenia's currency.